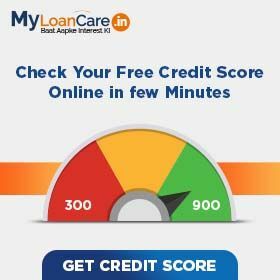 Estimate your CIBIL Score online free, based on your past repayment record of personal loans, home loans, auto loans and credit cards using MyLoanCare calculator. CIBIL score is calculated by various credit bureaus using their own proprietary algorithm, but the main elements of score composition revolve around loan and credit card repayment behavior of an individual. CIBIL score is a number between 300 and 900. Higher the score, better the credit track record of the borrower. The closer you are to 900, the more likely it is to get a loan approved from a bank. Experience says that a Credit Score of 750 and above can be considered as a good enough score by banks at the time of doing a credit appraisal of your loan application. Credit History: Your past credit repayment track record or your credit history is of the highest importance in the score calculation. The CIBIL blog mentions that your past credit track record has a weightage of around 30% in the formula for calculating your CIBIL score. All banks and NBFCs share the payment track record of each individual borrower with CIBIL on a regular basis. The credit bureau compiles data and uses the same for score calculation. This information captured is a month-on-month record of the latest 3 years of your payments towards your bills and EMIs capturing timely payments, delayed payments, settled and written off amount. Tip - Always make timely payments on all loan dues. Never leave any loan unsettled even if there has been a default or delay in payments. Credit Utilization: Your current outstanding loan obligations divided by your available limit is used to calculate the level of your credit utilization. A high and rising credit utilization ratio may have an adverse impact on your score as it signifies your rising loan burden and monthly obligations. The blog mentions that credit utilization ratio has a weightage of 25% in your CIBIL score calculation. Tip - Restrict your credit card over-dues to up to 50% of your credit card limit. Avoid taking multiple loans over a short period of time. Credit Mix: Your loan portfolio composition in terms of proportion of secured and unsecured loans also has a bearing on your score. Higher proportion of unsecured loans in your total loans portfolio has a negative bearing on your credit score. Credit Mix is estimated to have weightage of 25% in your score calculation. Tip - Restrict the proportion of unsecured loans in total loans portfolio to less than 30%. Avoid holding more than 2-3 credit cards. Other Factors: In addition to the above three factors, factors such as the number of credit applications you have submitted in the last few months also have a bearing on your score. If your CIBIL report shows multiple loan applications that have been rejected in the recent past, it gets reflected in a lower credit score. Banks are also averse to lend to borrowers, who have been rejected by other banks. These other factors are estimated to have a weightage of up to 20% in your CIBIL Score calculation. Hence, it is extremely important to apply to select banks after a thorough research and comparison of loan schemes of all banks in India. Tip - Do not apply for multiple loans over a short period of time. If you do not have other loans, spend actively on your credit card to build credit history. 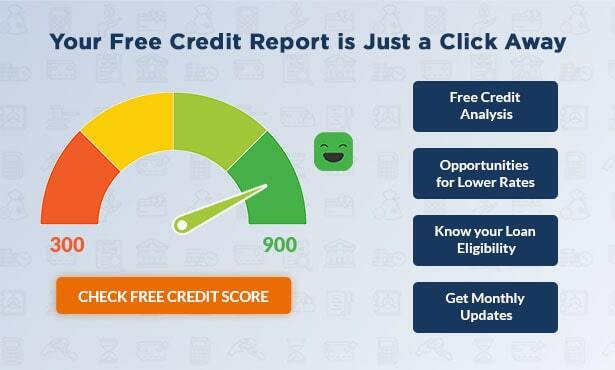 How to check credit score in India? CIBIL score is provided by CIBIL along with detailed Credit Information Report (CIR) on payment of Rs. 550 to CIBIL. From 1st January, 2017 you can ask CIBIL or any of the other bureaus, Experian, Equifax or Highmark to issue a copy of free credit report along with score without paying any charges. However, to simulate your CIBIL score based on your past credit history, you can also choose to use MyLoanCare. Free CIBIL Score Calculator. You can also check CIBIL score free by using PAN card. How to get online CIBIL Score? In the online world, checking your CIBIL report is just clicks away. Various online finance market places like MyLoanCare can calculate your estimated score fairly accurately. All you have to do is visit their site, fill your details in the ‘Free CIBIL score calculator’ and get your estimated score. Click on the ‘Get Your Credit Score’. Fill in the details relating to your PAN and identity proof etc. Click on ‘Proceed to Payment’. Once you’re redirected to the payment gateway, make the payment. Your CIBIL report and score will be sent to your email ID within 24 hours or to your shipping address if you opt for a hard copy. How do I check CIBIL Score by PAN card? PAN or Permanent Account Number is a common document that gives each individual a unique identity, allowing them to associate the PAN number with all their financial transactions. When a PAN is used for viewing your CIBIL, it makes it easier and quicker to locate your details and download your CIBIL report. You can choose to get a hard copy or a soft copy of your credit score report, following which your CIBIL report will be delivered via post or e-mail within 24 hours. Visit the official website of CIBIL (https://www.cibil.com/creditscore/). After choosing your subscription product, and filling in the details, click on ‘Proceed to Payment’. Your CIBIL report and score will be sent to your email ID within 24 hours. Why should you know your CIBIL Score? Ensure Accuracy: Your CIBIL report contains information of your credit history and payment track record of your loans. By reading your CIBIL report annually you can ensure that the information reflected in the report is accurate. If you find any corrections in the report, then you can address the problem on dispute resolution forum of CIBIL. Keep an eye on your loan accounts: A CIBIL report is detailed summary of all your loan accounts and credit cards. CIBIL report helps you in monitoring your loans and credit cards. If your CIBIL report shows any loan that you have never availed, then you can flag the problem on credit dispute resolution board for resolution. Maintaining your credit health: CIBIL score reflects your credit position. It tells you about the debt owned and the outstanding amount of your loan accounts and credit cards. If your CIBIL report shows low CIBIL score, then you can take active measures to improve your credit health. In summary, CIBIL report allows you to conduct a complete financial check up just like a health checkup to ensure that there is no financial stress or adverse factors impacting your credit health. A high CIBIL score, along with a clean CIBIL report on all key factors that are used for credit score calculation is one of the most important eligibility criteria for getting a personal loan from leading banks like HDFC Bank, SBI, Axis Bank, ICICI, Citibank and others. CIBIL does not publish any CIBIL Defaulters list. If you have defaulted in your loan payments, the same gets reflected as a lower CIBIL score in your report. A low score would mean that you are less likely to get a loan from banks and NBFCs in future, as and when your need it. Once, any negative credit event such as delayed payment or payment default is marked in your CIBIL report, it may hamper your chances of getting a loan for years to come. Rebuilding credit score is a long drawn process. Hence, prevention is always better and easier to be able to maintain a healthy CIBIL Score. You can achieve and maintain a good score by being prompt and responsible in paying and meeting your existing loan obligations. There is no good or bad score. Lenders tend to be little apprehensive granting loan to borrowers with score less than 700 for secured loans such as home loan. Banks in India tends to target customers with score more than 750 or above for unsecured loans like personal loan. Get an estimate impact of CIBIL score scale from 300 to 900 on your credit health. What it may mean for your credit health? CIBIL score between750-900 shows your exemplary credit history which will help you to get the loan with best market rates. The score between this range shows your impeccable consistency in repayments made in the past. With subject to credit report and eligibility, you will easily obtain home loan, car loan and other unsecured loans such as personal loans and credit cards. CIBIL score in this range also shows a great track record of the past repayments but sometimes banks need to conduct further credit analysis depending upon the internal credit policies to judge your credit history more precisely. CIBIL score in this range is considered low that reflects some of the irregularities in the past payments. Banks may feel dicey to give you loan except exceptional credit check. There are some banks who may consider you for loans but with the higher collateral and interest rates. Score in this range is considered poor that reflects your defaults such as write offs, past delinquencies and over leverage. You may face prime difficulty in obtaining the loan from any of the banks.